In celebration of Canada Day, Shikatani Lacroix has designed new in-branch décor for TD that will be displayed in branches throughout the country. Among the designs are maple leaf themed window clings, teller counter displays and floor decor, and a digital spot that will be displayed within each branch. For the Toronto and Vancouver flagship locations, a large 10-foot maple leaf was also created. 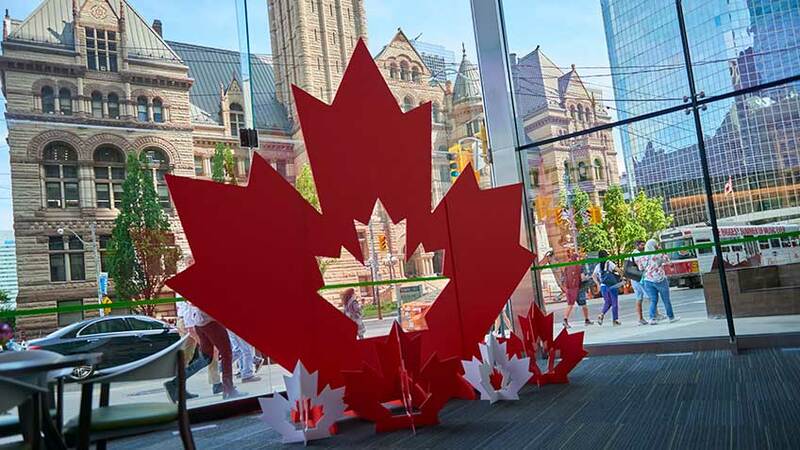 While reflecting Canada’s diversity, the new décor designs also promote inclusivity and an increased customer and employee experience in lead up to Canada Day. The Canada Day décor is the newest addition to TD’s Holiday Décor program, which also includes these winter-themed designs. The maple leaf themed décor will be on display until July 2, so make sure to stop by your local TD branch before it’s too late!